On the occasion of International Mother Language Day, Microsoft has announced support for e-mail addresses in 15 Indian languages, including Hindi, Bangla, Bodo, Dogri, Gujarati, Konkani, Maithili, Marathi, Manipuri, Nepali, Punjabi, Sindhi, Tamil, Telugu and Urdu. The initiative will allow people to use email addresses in their own languages, as well as send and receive emails to and from local-language IDs. The new service will be available across a wide range of Microsoft products, including Outlook, Office 365, Exchange Online and Exchange Online Protection. 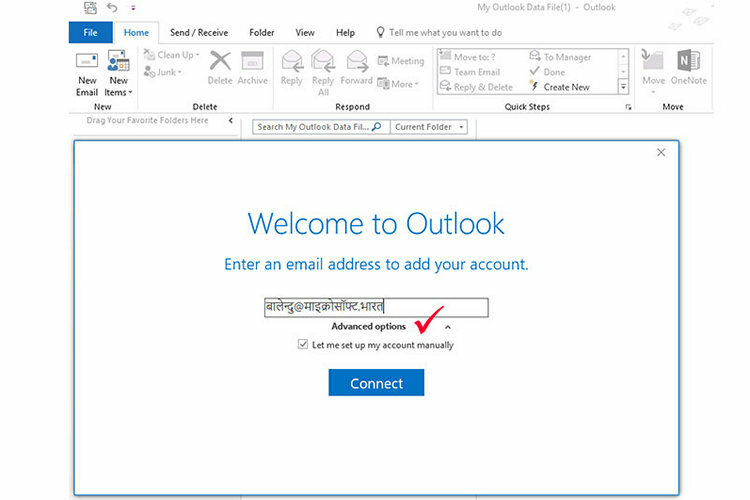 In case you’re interested in configuring Outlook to work with an Indian language account, you’ll be happy to know that the process will remain identical to setting up an English language user account. “Ensuring that language is not a barrier to the adoption of technology is key for digital inclusion and growth” was apparently a key objective of the initiative, says the COO of Microsoft India, Meetul Patel. According to Balendu Sharma, the Director of Localization and Accessibility at Microsoft India, the company’s “products and services work with Indian language email addresses in all languages that support Unicode, whether the email addresses are presently available or not, making the feature forward compatible”. As more and more Indians are starting to use the internet, tech giants like Microsoft and Google have started rolling out better support for Indian languages. The latest announcement from the Redmond giant comes just weeks after the company said that it will implement artificial intelligence (AI) and deep neural networks to improve real-time language translation to and from Hindi, Bengali and Tamil. While it is certainly heartening to find some support for our own languages on the internet, it will probably still be a long time before the quality and quantity of local-language content will match-up to the wealth of information available in English on the world wide web.